In this landmark book, she confronts the unprecedented fact that the human race is now the single dominant force of change on the planet. Humans have “subdued 75 percent of the land surface, concocted a wizardry of industrial and medical marvels, strung lights all across the darkness.” We now collect the DNA of vanishing species in a “frozen ark,” equip orangutans with iPads, create wearable technologies and synthetic species that might one day outsmart us. 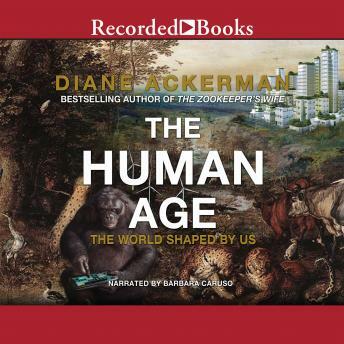 Ackerman takes us on an exciting journey to understand this bewildering new reality, introducing us to many of the people and ideas now creating—perhaps saving—our future. The Human Age is a beguiling, optimistic engagement with the earth-shaking changes now affecting every part of our lives and those of our fellow creatures—a wise book that will astound, delight, and inform intelligent life for a long time to come.